Located in the heart of Hobart, the Old Woolstore provides excellent accommodation to explore all the city attractions of Hobart CBD as well as touring around southern Tasmania. Providing hotel rooms and studio, one, two and executive apartment accommodation, the Old Woolstore is centrally located near Hobart's waterfront. 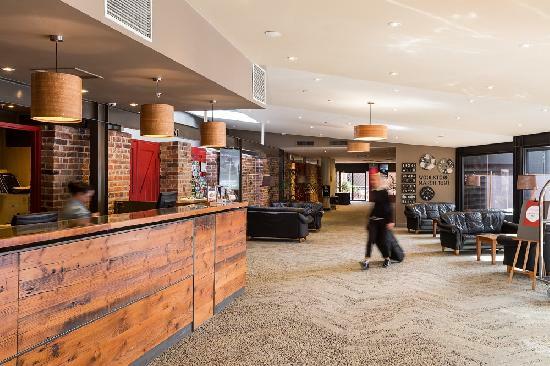 All types of travellers can take advantage of the discount accommodation at the The Old Woolstore Apartment Hotel, as well as the range of modern amenities including lounge bar, business centre, child minding, conference centre, direct internet access, disabled facilities, faxing facilities, free car parking, guest laundry, gym & fitness equipment, lift, massage, restaurant, room service, secretarial services, tour desk, garden, atm/banking, airport shuttle, security, 24 hour reception, baby cots available, babysitting service, daily housekeeping and express check in/out. Built behind the National Trust listed façade of one of Hobart's best known old buildings, the Robert's Limited woolstore, The Old Woolstore Apartment Hotel is a masterful example of how historic values can be preserved in the context of a truly contemporary development. We are committed to offering genuine, friendly and professional service to our guests. Our staff are encouraged to be themselves and make every effort to help make your time in Hobart as relaxing and enjoyable as possible. . Nearby Attractions : Hobart CBD, Salamanca Place, the Botanical Gardens, Victoria and Constitution Docks, the Hobart Aquatic Centre, Battery Point, the Taste of Tasmania, the Domain Tennis Centre, and the Federation Concert and Conference Hall. 2 Bedroom Mezzanine Apartment : Sleeps up to 5 guests on 1 Queen & 2 Single Beds. Hotel Room Double : Sleeps up to 2 guests on 1 Queen Bed & 1 Bed Extra. Hotel Room Twin : Sleeps up to 2 guests on 2 Single Beds. One Bedroom Apartment : Sleeps up to 3 guests on 1 Queen Bed. Two Bedroom Apartment : Sleeps up to 5 guests on 1 Queen & 2 Single Beds Or 2 Queen Beds.